og Falklandsskovleand, Tachyeres brachypterus, på Falklandsøyene. Note the spurs on the wing on the bird on the photo. they are modified spurs used in fights. They are often dull and worn down in flightless, and much more pointed and slimmer in flying. 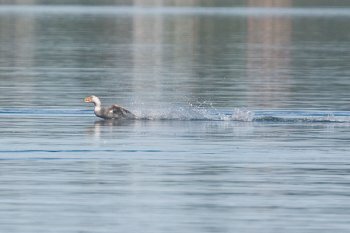 The Chubut Steamer Duck or White-headed Flightless Steamer Duck (Tachyeres leucocephalus) is a flightless duck endemic to Argentina. 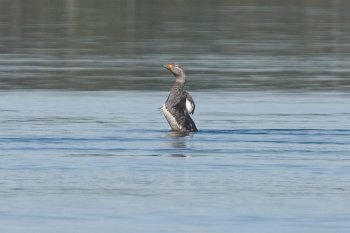 It is the most recently recognized species of steamer duck, being described only in 1981. 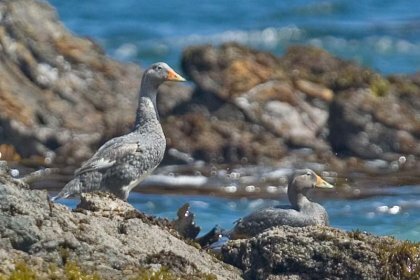 This is because it is only found along a rather small and sparsely populated stretch of coast around the Golfo San Jorge in southern Chubut and northern Santa Cruz Provinces, and because steamer ducks in general look fairly similar in plumage. Tachyeres leucocephalus was previously considered to be restricted to the south coast of Chubut province, Argentina. Bahía Melo and Caleta Malaspina, all located at northern San Jorge Gulf. The population is thought to be stable4. It appears to occur at very low densities throughout its range. 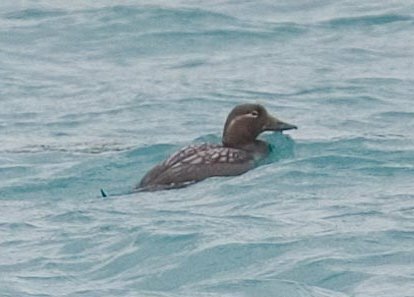 It is entirely coastal in rocky areas and sheltered bays, breeding on offshore islands and peninsulas. the other being Cobb's Wren. 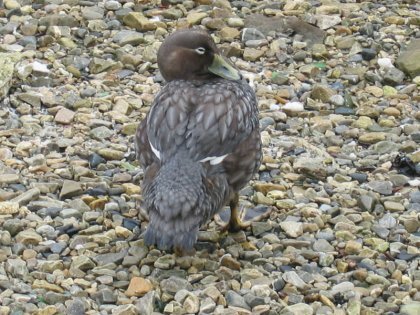 Female Falkland Flightless Steamer Duck, Tachyeres brachypterus at Port Stanley. and it is incapable of flight. 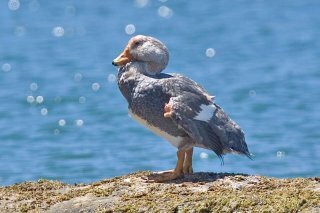 The plumage of the Falkland Steamer Duck is mostly dark grey, but with a white stripe behind the eye. although the Flying Steamer Duck can fly, it rarely does. coast except steep cliffs. Each pair holds a territory comprising of a set length of coastline which it guards vigorously. Nests are built behind the shoreline with 5 - 10 eggs being laid during September to December. Young fledge in January to March. Food is mostly shellfish and other marine invertebrates which it collects by dabbling or diving.